Paul Rattray explains proactive accounting and how it can help your business grow. Paul, the term ‘proactive accountant’, what does that mean to you? 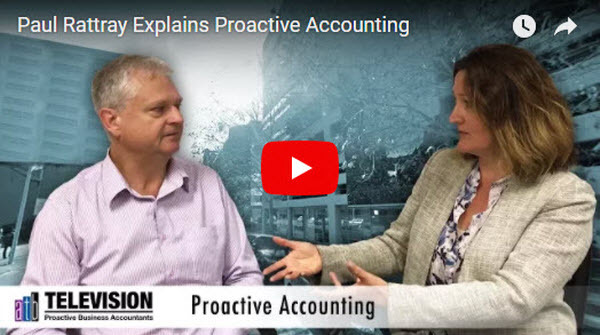 “A proactive accountant is not just someone who does your books and works out your accounts – they are a business advisor, who takes an active role in your business and helps you grow. It’s someone who works proactively with you, makes you more accountable and makes you think about what you’re doing with your business. That might involve someone who will ring you and engage with you more, workshop ideas with you, plan for the future and generally be more involved in your business. It’s more of a mentoring role”. So if I want to make a purchasing decision, I can ring you and ask? And what about making decisions for tomorrow? For the business owner what does that do? Does that lead to people enjoying their businesses more? What skill set is required from an accountant to achieve this? Want to know more about proactive accounting? Contact us we’re here to help.